And with that from a tetchy Jurgen Klopp I bid you farewell. And Swansea v West Ham has just kicked off over here. Enjoy Sports personality of the year and we will see you all soon. 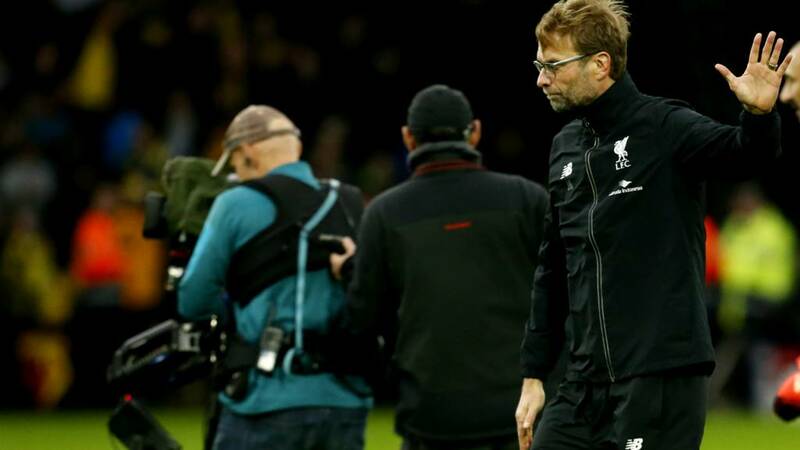 More from Liverpool manager Jurgen Klopp, speaking to BBC Sport:On Adam Bogdan’s error: “He knows he should fix the first ball, and he knows he fixed the second ball, but the referee didn't see it. Things like this happen. I am not angry with him – I am only angry about our reaction. That is what we have to learn. Immediately." What has changed since the 6-1 victory over Southampton in the League Cup? “I think a lot of things have happened. It is not too easy to tell all these things in a short time. It is football. We have to play better, to use our skills. Today we had a few players coming back after injuries, things like this happen. We have so many games and we can show our reaction in our next game against Leicester. We have to show we have learned from this game." An unhappy Liverpool manager Jurgen Klopp, speaking to BBC Sport:On Nathan Ake’s opening goal: "If you watch the TV you see he had it under control and both hands were on the ball. But that is not the biggest mistake. It should not be allowed but first of all he should not drop the ball. That is the mistake of the referee but the biggest mistake was our reaction. "Always in football it is like this, somebody makes a mistake and you get a goal but you have to react better. We didn’t play how we wanted to play. We played how they wanted us to play – in small spaces, we played very complicated, and we always gave them the chance to press. "When we played it easy it was better, and we had our moments.The start of the second half was good and with a bit of luck we could have scored two goals. But we didn’t score the goal and it was always possible one of the counters decides the game. "It was a deserved win for Watford. Not because of our faults, but more our reaction to the our faults." Liverpool goalkeeper Adam Bogdan: "It was a wrong time to concede. I dropped the first ball which is a mistake, I hold my hands up, but I felt I recovered the ball and he kicked it out of my hands. But if I catch the first one it's not a goal. "Something went wrong, I have to think about it again. It was a mistake and I will learn from it. I felt good, it wasn't nerves. I trained hard for this chance and it started as a nightmare. I don't blame the referee or anyone else, I go back to train and work hard." All credit to Liverpool keeper Adam Bogdan for facing the TV cameras - he says that the ball was in his hands but it's his mistake for dropping it. I can't readily remember political scientist Francis Fukuyama's views on football, but could the approach of Watford and Leicester this season be the endpoint of the game's evolution? Can Watford finish in the top four? “[Laughs] I don’t want to talk about that. It is the moment to enjoy after this match, I like the happiness and I want to enjoy, the fans to enjoy. We should be humble. This is our one advantage, because the Premier League is very tough. We have a lot of matches to play. We never underestimate the teams we play. Of course we want to dream but we want to remain humble. We are completely happy with the performance. It was an amazing victory against an amazing team." 'Our reaction was really bad"
Liverpool manager Jurgen Klopp, speaking to Sky Sports: “It was a bad start to the game. Of course the first ball from Adam Bogdan, he should keep and he drops it. Having seen it again usually it is a foul but it is 1-0 and our reaction was really bad. We lost our mind and stopped playing football. The second goal was very easy, we can defend this better. We tried a bit in the first half and changed a bit at half-time. "The start to the second half was very good, we could have scored two goals, but we didn’t and then the third goal. Yeah, game over. “The first one is his [Bogdan's] fault, but then both hands on the ball, that is the goalkeeper safe, he has the ball, I think the referee didn’t see it. It was the wrong decision but we made more wrong decisions. "Martin Skrtel is injured now, that is a problem I don’t know who will come back in this moment. Nobody had a rest, now we have to look who is available for Boxing Day." Everyone in Watford colours has laughed off talk of a place in the Champions League - but how high can they finish this year? Henry Weston: We lose 3-0 and both Ake and Ighalo on the bench in my fantasy football - awful week! Christopher: Safe to say Klopp's honeymoon period is well and truly over. We've been shockingly poor. Credit to Watford though. I hope they and the other promoted teams stay up - they're showing the stereotypically bigger clubs how it's done. Not that any Premier League side ever reached Barcelona levels of possession football, but with the likes of Leicester and Watford stunning the big clubs this season - is their high-tempo counter-attacking style here to stay? Ralph Goga: #bbcfootball #2015/16 #premierleague proving possession for possession's sake is pointless if you don't do anything with the ball!! "It was a wrong decision - but we made many more wrong decisions," says Jurgen Klopp when asked about the decision for Adam Bogdan's error. It's goal mad in Madrid, that's five goals and two red cards already! Liverpool may be a team in transition, but they need to start fulfilling their potential, according to former player Jimmy Case. "We know the problems facing Liverpool but there are no excuses - this team is young enough and have enough quality," he says. "Klopp needs the time to get a couple of new players in and get them gelled a bit more. "But the way the league has gone I wouldn't be surprised if Liverpool beat Leicester at home now." Watford have already equalled their entire points tally from their last Premier League season in 2006-07 (28). Watford captain Troy Deeney: "That's four wins in a row which is massive in the Premier League and starts our so-called tough run that everyone is talking about. We show no fear against anyone. Odion Ighalo is on fire. "I know he is making the runs which makes life easy for me, I just put it in the space and he causes anyone problems. "If Leicester are still talking about getting to 40 points, so are we. We'll see about this top-four nonsense in March!" Odion Ighalo: "From the first minute you could see that we were after the first goal. We had no fear. I just make runs in behind and I know that Troy can find me. We have a connection." After Ighalo hands Deeney his man-of-the-match award, Deeney says: "that's the first pass I've had off you all season!" It's been a Leicester love-in this season but as BBC Sport's chief football writer Phil McNulty says, Watford are providing plenty of warm feelings too. This is Liverpool's heaviest Premier League defeat to a promoted side since losing 3-0 to Newcastle United in November 1993. "Jurgen Klopp will come out on to the pitch here but that's another defeat after such a sparkling start to his managerial career at Liverpool. "It's early days of course but now he's got to deal with the situation of things not going well." While we wait for Quique and Jurgen, you may wish to head over to a cracker in Spain where Real Madrid are in some early strife. Find out what's going on here. Well, we should get plenty of good reaction from that one! Keep it coming. Jamie Thorpe: #bbcfootball imagine if both Leicester and Watford qualified for Europe. What a story, and completely deserved! Alistair Lowe: #bbcfootball Watford tremendous! Liverpool dire. Never in the game. Just goes to underline the scale of Klopp's job, which he knew already. Jurgen Klopp gives Quique Flores a hug before the final whistle as Watford go to within a point of the Champions League places! Ross in Kent: Liverpool have been well and truly stung to death by the hornets today! Brendan Rodgers is probably laughing somewhere! Into the last knockings at a jubilant Vicarage Road. What a win for Watford - their first over Liverpool since 1999. Ex-Liverpool midfielder Jimmy Case was already angry at Emre Can and after that third goal he's absolutely furious. "It was Can's fault yet again - he lost possession in the build up to the goal and he nearly cost Liverpool earlier," he says. "He went racing over the far side like a bull in a china shop. "I don't understand what he does in the middle - he doesn't dominate, he doesn't pass well and he has no vision." If you were naming the PFA team of the year now how many players would you have from Leicester, Watford, Crystal Palace and Everton? Odion Ighalo has been brilliant and he comes off to a huge ovation. A really, really good goal to cap a stunning display from Watford. Etienne Capoue, Mr. perpetual motion in the midfield , starts it by winning the ball back high up the pitch, Troy Deeney picks out sub Valon Behrami on the right and his first-time cross is headed between the legs of Adam Bogdan by goal machine Odion Ighalo. Christian Benteke wastes an attack as he is offside, so frustrating to see a striker do that when it's unnecessary. Into the last 10 minutes, Liverpool need to score now if they are to get anything from the game. Damian O'Neill: #bbcfootball At least pool have a home game against Leicester to bounce back with - oh god I keep forgetting! Bafetimbi Gomis is in for Swansea, replacing Wayne Routledge in their only change. And just the one change for West Ham too, with injured striker Andy Carroll out and Nikica Jelavic in for his first Hammers start. Swansea XI: Fabianski, Rangel, Fernandez, Williams, Taylor, Britton, Cork, Ki, Sigurdsson, Ayew, Gomis. Follow a live page for the build-up to that one here. Luke in Portsmouth: Klopp has completely misunderstood the expectations of English football. Celebrating like they'd won the league, after scrapping a point at home to West Brom...says it all really. His side are not good enough. Just over 10 minutes remain, Liverpool continue to see the lion's share of the ball but still continue to threaten sporadically at best. Hornets defender Miguel Britos does go into the book for a tug on Christian Benteke. It's not long since I saw Ikechi Anya score for a Northampton team heading for relegation into League Two. He is now on for a team chasing the Champions League. Extraordinary. The Scotland utility man replaces Jose Jurado on the left flank. It's fair to say Mamadou Sakho has not enjoyed his afternoon. But is all the criticism warranted? Alan North: #bbcfootball Sakho has to be the most awkward and clumsy centre half I have seen since Titus Bramble. Simply dreadful. Adam Lallana and Roberto Firmino are OFF, Christian Benteke and Jordon Ibe are on for Liverpool. They have just under 20 minutes. A tired clearance from Miguel Britos is played straight to Emre Can 25 yards from goal, he takes a touch and then fires in a shot which Heurelho Gomes turns away for a corner. That comes to nothing as Jurgen Klopp looks like making more changes. Jimmy Case on BBC Radio Merseyside sees a glimmer of hope for Liverpool. "That save from Bogdan has given Liverpool a chance to get back into this game," he says. "But only if they can score the next goal." Games at Leeds and Reading are just about to get under way, while in the 14:00 match Sheffield Wednesday lead Wolves 2-1 at the break. Follow all of that action here. Duncan in Isleworth: If the Boxing Day pantomime is as comical as Liverpool's performance today it should be a cracker! Mamadou Sakho will go to sleep seeing Troy Deeney and Odion Ighalo in his dreams. Or nightmares. Plenty of Liverpool gripes out there, but also plenty of well-deserved praise for Troy Deeney and Odion Ighalo. The Watford strike pair have tormented the Liverpool defence. Great save! Adam Bogdan goes some way to redeeming himself with a really superb stop but Odion Ighalo should have secured the points for the Hornets. Mamadou Sakho slips over under no real pressure to pave the way to goal for Ighalo, he's in one-on-one, the goal is gaping - but Bogdan spreads himself to make a flying save. Has that kept his team in it? Adam Lallana heads a long punt wide as ironic cheers greet an overcued cross from Alberto Moreno. The Mirror's John Cross is a big fan of Watford striker Odion Ighalo's flair at Vicarage Road today. Blame it on the Christmas jumper? It Liverpool's not-so-natty knitwear the root of their pre-Christmas woes? That is brilliant from Odion Ighalo! He leaves Mamadou Sakho on his backside with a brilliant turn into the penalty area and then a flurry of red bodies just about scramble the ball away from danger. Liverpool's defending is woeful, but some of the Watford attacking play is divine. Jimmy Case is furious with Jordan Henderson after his tame cross. He asks: "How do you even manage to give it straight to the keeper in that situation?" BBC Radio Merseyside commentator Ian Kennedy agrees: "It was an absolutely terrible cross from Henderson." Liverpool are leaving two on two at the back and Odion Ighalo and Troy Deeney fancy their chances on the counter-attack. Liverpool's two just about squirt the ball away as Deeney looked like running in on goal for number three. Don't go anywhere, there are goals in this. I'm not too sure what formation Liverpool are playing now, but it's at least five up front. Jordan Henderson is on the right wing, he has men over but can only float a cross at Heurelho Gomes in the Watford goal. Disappointing. Adam Bogdan comes for a long ball forwards - I can't watch - but he just about scoops it up this time. Liverpool instantly attack and Roberto Firmino is denied by the offside flag. Next goal feels massive. Adam Bogdan has kept just one clean sheet in his 25 Premier League appearances to date. Just so you know. There was a lot of activity from the Liverpool subs at half-time. All set? How much sympathy do you think is out there for Liverpool replacement keeper Adam Bogdan after his early struggles? That's right - almost none. Watford have made the most of conditions and Liverpool's wobbly defence, according to former Reds player Jimmy Case. "It's been a disappointing half for Liverpool but Watford are playing with that knowing belief there is a forward running player and it's difficult to play against," he says. "It's not long ball, it's played into an area speculatively where it's awkward on this type of pitch for defenders to take control." Vicarage Road stands to a man - minus the away end - as the Golden Boys come off with a healthy 2-0 lead. Makeshift centre-back Lucas makes a makeshift clearance. The men in red look terrified of any ball into the penalty area. Jurgen Klopp may bring himself on at half-time. I don't want to worry Liverpool fans even more but it looks like Lucas is currently playing in defence. Against Odion Ighalo. After a long stoppage Ben Watson lines up the corner and does exactly what the situation demands - hard and fast, whipped in at Adam Bogdan's head! Martin Skrtel limps slowly to the sidelines and Jurgen Klopp tells a bemused Kolo Toure to sit down - on comes Divock Origi instead. A tactical reshuffle on his hands here for Klopp. Emre Can at the back? The Times' Henry Winter has spotted referee Mark Clattenburg trying to clear up why Watford's first goal stood. Some credit for Watford's front two though - every centre-back they've come up against this season has struggled. Who would Liverpool even target at the back? I don't see many good alternatives around. Martin Skrtel is struggling again now after stretching to hook a ball away. Liam Haywood: #bbcfootball Liverpool seem to be a team that's always in transition, they have 1 good season then have to rebuild for 7 years. It's a bit archaic, a bit Graham Taylor even, but if I was Watford boss I'd be pumping balls into the mixer and seeing how Adam Bogdan fancies going up against Troy Deeney and Odion Ighalo. "Get a name on it!" Martin Skrtel is back with us and the game is back under way. That will add on a few minutes to the first half as Troy Deeney wins a throw with some more intense pressure. "He seems to have no vision whatsoever - Jordan Henderson was in a great position there," he says on BBC Radio Merseyside. Plenty of time for Liverpool to come back yet, or for Watford to increase their lead. A break in play as Martin Skrtel needs treatment for an awkward fall. Both managers use the interval to get into their players, lots of hand movements and geeing up. Skrtel is struggling, landed on his back. From where are Liverpool going to find two goals to level things? Manager Jurgen Klopp gave striker Christian Benteke's spot to Roberto Firmino today, but there's been little sign of the 'false nine' system that worked so well away to Chelsea and Manchester City taking hold here. In Martin Skrtel's defence, Odion Ighalo may be shorter than him but he's pretty dense. I don't reckon many players could knock him off the ball. An absolute outhouse. Martin Skrtel was comprehensively shrugged off by Odion Ighalo in the build-up to Watford's second goal. Has the Slovakian been found out? Watford are a point off a top-four place as it stands. Could be they, Leicester and Crystal Palace in the Champions League next season if this mad season continues apace. Some excellent Jurgen Klopp histrionics on the touchline as a red shirt gives the ball away. I don't' know what he wants but he wants more of it, NOW. Hitting it wide early isn't really Liverpool's style. They have had 69% of possession in the opening 20 minutes or so but have nothing to show for it. Adam Lallana wants a penalty for a block by Miguel Britos before Liverpool left-back Alberto Moreno slams into Allan Nyom. Former Liverpool midfielder Jimmy Case isn't pleased with the visitors' lack of incisive attacking edge. "Liverpool haven't had any penetration or consistent pressure - though Watford are in a great formation to stop them playing now. "The only way they'll get into this game is a cute long ball out wide hit quickly to catch out Watford." Mike in Edinburgh: I can't be the only Liverpool fan who misses Pepe Reina! David in London: An early Christmas gift from Bogdan wrapped in yellow and black ribbons. Everyone has been saying all season that Watford's front two and their 4-4-2 are a refreshing throwback but I'll add to the chat - it truly is. Give me a big powerful centre-forward to watch any day of the week. Much like Christian Benteke, who is on the bench for the visitors this afternoon. "Ighalo got in front of Skrtel and once he did that Liverpool were in trouble. "Watford have only had two opportunities and they've scored from both of them." Nobody can stop Odion Ighalo! He's the new Romelu Lukaku/Jamie Vardy as he scores for the fourth game in a row. It's a lovely old-school goal too, Troy Deeney helping the ball over the top for Ighalo to chase, but you would make Martin Skrtel favourite. However, Skrtel bounces off the powerhouse like many a centre-back before him, Ighalo gets away and despite the angle being against him he manages to scuff a shot across the face of goal and in off the far post. Still an Adam Bogdan error for me, he was under no pressure originally and shelled the initial catch like an English slip fielder on a 1990s Ashes tour. Interestingly, if Premier League games ended at half-time this season, Watford would be top of the league with 27 points. They like a brisk start. Or was Adam Bogdan in possession of the ball? Should Liverpool have been awarded a free-kick? Watford are a point behind Manchester United in the Premier League table as it stands. They are also at least 500% more entertaining to watch for the neutral. Liverpool have mounted a decent reaction as Adam Lallana and then Emre Can both drive into the Watford penalty area and force corners. Philippe Coutinho then hits the target with a swerver from 20 yards but Heurelho Gomes makes the easy stop. "As it's gone back into Adam Bogdan's hands it looks like a Watford player has kicked or handballed it out of his hands. "A goal so early in the game picks up the crowd but now Liverpool have got to settle down and play the way they can, which takes a bit of time." On second viewing from another angle there is the suggestion that Adam Bogdan may have had the ball in two hands as Nathan Ake connected with the ball. Should that goal have been ruled out? It's an odd one as Bogdan caught the ball, dropped it and then reclaimed it on the bounce as Ake met the ball. That was as bad a goalkeeping error as I can remember. Absolute bread and butter stuff. But Watford have started brilliantly, putting the Liverpool defence under all sorts of pressure so far. Klopp-like intensity. Dear oh dear oh dear! There was some suggestion that Adam Bogdan may have been selected in goal today whether Simon Mignolet was fit or not, with Mignolet singled out for being poor on set-pieces against West Brom last time out. Well, whatever is wrong with Liverpool keepers, it's catching. Or not. Ben Watson swings in a corner which is easy for Bogdan, I mean really, really routine stuff. But he shells it somehow, dropping the ball at the feet of Nathan Ake, who cannot believe his luck and taps in from a yard out. Jurgen Klopp will have felt a tug of his heartstrings as the players emerge at Watford - fans behind the goal erect a cracking full-length mural which is Dortmund-esque in its style, if not scope. 'Deceptively warm, innit?' is the insight from Watford captain Troy Deeney as the teams line up in the Vicarage Road tunnel. It sure is Troy. It sure is. All set? Why bother with the big clubs? Steve in Sussex: I have to say the ultimate test for any "super" manager like Guardiola or Mourinho is to manage a club like Swansea (who I support funnily enough) rather than a big club and lead them to the title. Then without question they have legend status as they already have enough money?.....Just a thought. The first domestic goal of the day has come at the Bescot - read all about it, and the upcoming Championship action, in the Football league live page here. Watford: Gomes, Nyom, Cathcart, Britos, Ake, Abdi, Watson, Capoue, Jurado, Ighalo, Deeney. Subs: Behrami, Oulare, Guedioura, Anya, Holebas, Diamanti, Arlauskis. Liverpool: Bogdan, Clyne, Skrtel, Sakho, Moreno, Henderson, Lucas, Can, Lallana, Firmino, Coutinho. Subs: Toure, Benteke, Allen, Origi, Ibe, Fulton, Randall. If Jose really wants to prove his credentials he needs to take the Colchester job, lift them off the bottom of League One, shape up that defence. Basically we've not seen him perform without money before, would be interesting to see him at a club without billions of pounds behind him. Of all the madcap things to have happened at Leeds United over the last few years, Pep Guardiola or Jose Mourinho rocking up at Elland Road would be the most shocking. Watford are the 11th newly-promoted side to have won 25+ points in their opening 16 games of a Premier League season - none of the previous 10 have been relegated. Are the Hornets already looking safe? The Sir Elton John stand is filling up nicely at Vicarage Road ahead of the first Premier League action of the day. Which Liverpool side will we see turn up today? It's been a miraculous season so far for Leicester but reality could start to bite, with their squad depth tested by injuries to the likes of Jeffrey Schlupp. But the man himself is in high spirits as he continues his recovery from a hamstring problem. Can Leicester win the league? All of the talk is about a three-way bidding war between Man City, Man United and Chelsea for Pep Guardiola. But are Arsenal in the running? Kaushik Gorai: #bbcfootball Simeone At Chelsea, Guardiola at MCFC, Mourinho at MUFC, Klopp at LFC, Its time for Arsenal to get one of the big name manager. Richard Hope: Are we sure Mignolet hasn't been dropped and hamstring excuse is just to save face? Trevor Sinclair agrees with Sutton's view of Chelsea's players, saying: "They should be embarrassed, it's an absolute disgrace." But Shaun Custis adds: "You've got to blame Mourinho too, every week he was creating a drama. "The rucks with Eva Carneiro and the players were bizarre, it was great box office at first but then it became a bit tedious." After Chelsea 'toasted' the sacking of Jose Mourinho with a 3-1 win over Sunderland, Chris Sutton called the players 'a disgrace' and the former Blue is sticking to his view. "They should hang their heads in shame," he says. "The least the fans expect is players to play for the jersey, to run around, chase back and put in the effort and they weren't. "But there was only one way after Mourinho's comments about betrayal - he knew what he was saying and he had to go." The Sports Personality of the Year awards show is almost upon us (tonight at 18:50 GMT) and the BBC Sport website want you to recreate your favourite sporting moment of the year and send in the picture. Whether you want to get the entire family to don their Christmas jumpers and do that Stuart Broad face or you get the children out on the park to do a re-run of a goal from the FA Cup final, we’d love to see the end result. We’ll post the best on the BBC Sport website during the live show on Sunday. All you have to do is tweet us, using #spoty. Get snapping. "A goalkeeper getting a tight hamstring? In my day they just did a few volleys in the warm up and went in. "They must be training properly these days..."
Chris Sutton is at least slightly perplexed by the injury to Simon Mignolet that keeps the Liverpool keeper out of today's clash with Watford. Adam Bogdan is the man between the sticks at Vicarage Road. "I went from being a Fourth Division player to a top-flight player under Gerry Francis at QPR, just working on drills and shape. It is boring but vital, and if you do it well you'll succeed. That's exactly what Watford have been doing, and they have got their rewards so far this season. "Look at Troy Deeney up front - he does such tireless work for the team, and he reminds me of a Carlos Tevez. He does the hard yards and Ighalo gets the goals." "He is a positive manager, he is funny and he doesn't looks under pressure. He is educated and his philosophy is offensive as he is always thinking about how he can score more goals. "He's proving a lot of things and when he decides his first-choice XI Liverpool will go for the top. "But I'm focused on the players. As managers we plan, plan, plan but the players on the pitch are the most important. I'm not thinking too much about the coach." Now over to Vicarage Road for a word with Watford legend Luther Blissett, who is understandably elated with the Hornets in seventh as they take on Liverpool later. "It's been fantastic to be back in the Premier League - at the start it was just about trying to stay in the division. "We also bought in a lot of new players and everyone thought it would take us a couple of months to get going but they've hit the ground running. "It's great to be seventh at this stage but hopefully Leicester keep going well to take some of the pressure off us." Norwich defender Sebastien Bassong is on the phone now and admits the Canaries felt nothing to fear about playing at Old Trafford in victory over Manchester United yesterday. "It sounds weird but we knew we could get a result there yesterday," he said. "It's been a hard season so far but we're totally aware of our squad's abilities. "We're definitely capable of staying up and that win just gives us a boost in the right direction." The fear factor has long, long gone from Old Trafford. Sir Alex packed it up with his briefcase and wine chiller. I'm all for a footballing peerage. It has never done Sir Les of Ferdinand any harm after all. And the Norwegian press have knighted Alex Tettey after his toe-poked winner at Old Trafford yesterday. "Sir Alex Tettey flipped Van Gaal to the precipice." So with Jose Mourinho also now available, do Man Utd strike early and sign up the (former?) Special One? "I don't think Mourinho will come in soon, maybe at the end of the season," said Sutton. "But van Gaal should be given time beacause of his record but he needs to change things. "Perhaps managers should just sign three-month contracts because if you lose enough games over that time, you're out of the door anyway." What do we think is the long-term future for Christian Benteke at Liverpool? I'm not sure he suits Jurgen Klopp's way of playing - particularly away from home. Watford manager Quique Flores names an unchanged side from the team that won 1-0 at Sunderland last weekend and Valon Behrami returns from calf injury to make the bench. Watford XI: Gomes; Nyom, Britos, Cathcart, Ake; Capoue, Watson; Abdi, Deeney, Jurado; Ighalo. Liverpool manager Jurgen Klopp makes four changes from the team that drew 2-2 at home to West Brom last weekend. Defender Mamadou Sakho returns from ligament injury to replace the side-lined Dejan Lovren, while goalkeeper Adam Bogdan makes his Premier League debut in place of Simon Mignolet, who has a hamstring problem. Midfielder James Milner, also injured, is replaced by Lucas, and Roberto Firmino comes in for Christian Benteke. Ryan Fulton, 19, is named substitute keeper. Liverpool XI: Bogdan, Clyne, Skrtel, Sakho, Moreno, Lucas, Henderson, Can, Lallana, Coutinho, Firmino. Shaun Custis points out that while it's not open mutiny at Old Trafford yet, a change in style of Manchester United TV is a sign of the growing pressure on Louis van Gaal. "MUTV can be like the North Korean state broadcasting system at times," he said. "But even they are criticising their team under Louis van Gaal. "Once you've got your own TV station having a go at you, you've really got problems." I'm not sure even Jose Mourinho would back himself there. But let's imagine you are the chairman of your team - no matter what level. What could you offer Pep or Jose? Let us know on #bbcfootball or text us on 81111. The panel turn their thoughts to the pressure on Man Utd boss Louis van Gaal following their 2-1 defeat to Norwich at Old Trafford on Saturday. "He's spent £250m over the past year or so and there hasn't been the progress," says Chris Sutton. "He's not buying into the club's identity and ethos - they were a swashbuckling team where he's more of a methodical manager. "They're not the club they once were - it's a critical few weeks for him." The team news is just dropping from Vicarage Road, and Liverpool will have Adam Bogdan in goal this afternoon as they make four changes. Liverpool sit in ninth spot after 16 games - they can move above their opponents Watford with a win. Victory for the Hornets would see them move to within a point of sixth-place Crystal Palace. Barcelona won their fifth trophy of 2015 after clinching the Fifa Club World Cup for a third time with a comprehensive victory over River Plate. River could not cope with Barca's Luis Suarez, Lionel Messi and Neymar. Messi scored the opener after returning from a kidney problem when he controlled Neymar's pass to finish. Suarez latched onto Sergio Busquets' brilliant ball over the top to double their lead and then added his second with a header from Neymar's cross. Uruguay striker Suarez finished the tournament with five goals in two games after scoring a hat-trick in the 3-0 semi-final win over Guangzhou Evergrande. Jermaine Jenas: "Watford’s form is down to the organisation Quique Sanchez Flores has put in place. Defensively they look so solid too and then they have Troy Deeney and Odion Ighalo up front." Gary Bowyer: "Watford’s front two are unbelievable. They were such a handful in the Championship. You always have a chance when you have strikers like that. They had fantastic movement and great understanding. You can’t keep them quiet for too long." Can Liverpool keep these two quiet this afternoon?Image caption: Can Liverpool keep these two quiet this afternoon? The Sun's Shaun Custis suggests Pep Guardiola's interest in a club's history could lead the Spaniard to the red side of Manchester after all. "When you write something about a manager going to a big club you often get a really angry call from a communications officer saying you've got it wrong," he says. "But when you write 'Guardiola to Man City', you don't hear a peep. "There are a lot of things in place there but if you've managed Barcelona and Bayern Munich, wouldn't you want to go to the biggest club in the Premier League? And that's still Man United." A Leicester City fan was reduced to tears when talking to former Foxes midfielder Robbie Savage on 606 following their win 3-2 at Everton. The result saw the club go five points clear at the top of the Premier League, after being bottom of the table over Christmas last year. Lee, who is a lifelong fan of the club, is overwhelmed when describing the feeling of his son looking him in the eye and saying, "Dad, this is amazing." "With all this speculation over Pep Guardiola I feel sorry for Manuel Pellegrini. "Man City are still in contention for the Premier League, the Champions League and they've progressed better than ever this season. "But his time could well be up now." Do we see Pep in sky blue next summer? Get Involved - Choose us! Could a riverside vista and an easy commute sway Jose to take the Fulham job?Image caption: Could a riverside vista and an easy commute sway Jose to take the Fulham job? With Pep Guardiola and Jose Mourinho now on the lookout for new jobs, there will surely be no shortage of clubs interested in hiring them. Let's imagine you are the chairman of your team - no matter what level. What could you offer Pep or Jose? Could the chance of a pint of every corner of the ground mean that it's Brentford next for Pep?Image caption: Could the chance of a pint of every corner of the ground mean that it's Brentford next for Pep? Sell your club to Pep or Jose via the medium of social media! Or maybe the pull of the English riviera and the long-term challenge of establishing Torquay United as a big hitter means they are in pole position?Image caption: Or maybe the pull of the English riviera and the long-term challenge of establishing Torquay United as a big hitter means they are in pole position? "I don't think it's a big surprise, it's how football is. "If you have a good team, of course you need good players, but if these players together are a really good team, if you have a good plan like they have and if you play football like they do, then it's not easy but it's possible to be more successful than everybody expects. Jonathan Overend is your host on BBC Radio 5 live this afternoon as he paints you a picture of the day's sporting action. At 12:15 GMT 5 live brings you MOTD2 Extra, and we have full match commentary of Swansea v West Ham at 16:00 GMT. You can join Ian Brown and John Hartson for that one. Listen online, on your radio or on your computer/tablet/phone inside this page! The front three have done the business again this morning as Barca are set to add another trophy to the collection. Follow the closing stages from Japan here. The best Premier League player of the last decade?Image caption: The best Premier League player of the last decade? The day's action is already under way in League One where Walsall host Port Vale. If you are a Bescot type of person the good news is there is a separate live page for that here. Time for Louis van Gaal and Manuel Pellegrini to shift uneasily in their seats. It has been confirmed this morningthat Pep Guardiola will leave Bayern Munich at the end of the season, to be replaced by Carlo Ancelotti. A decent sub if you ask me! But where will Pep head next? Coming up at 12:15 GMT on BBC Two, 5 live and on this page it's MOTD2 Extra. Join Chris Sutton, Trevor Sinclair and Shaun Custis as they chew over the weekend's talking points. After 22 goals, more brilliance from the Foxes, more wasteful stuff from Manchester United and another win for Bournemouth yesterday, there are just the two Premier League matches to focus on this afternoon. Nope, you are not dreaming. Leicester City are top of the Premier League at Christmas. And they are currently five points clear! Chelsea have sacked Jose Mourinho and are just above the relegation zone, Liverpool have appointed Jurgen Klopp and Cameron Jerome is scoring goals at Old Trafford. As Premier League seasons go, this has been a vintage half year for stories. And, on the last Sunday before Christmas, we have the chance to serve up some more. Watford to beat Liverpool? Marcelo Bielsa in at Swansea? Jose to Manchester United? Welcome to our live page for Watford v Liverpool. We’ll have build-up, Radio 5 live updates and text commentary here from 12:15 GMT. You can keep up to date with all the build-up to Swansea v West Ham here from 15:30 GMT.